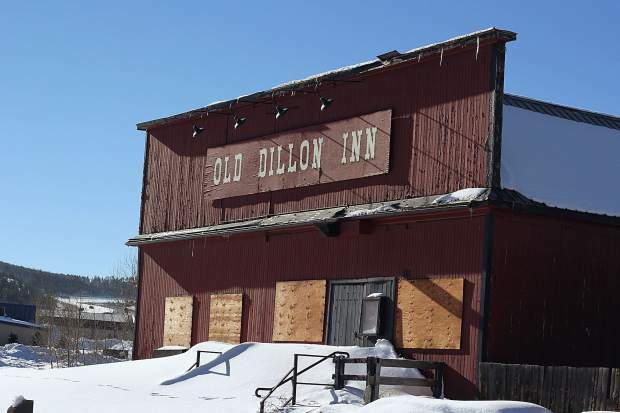 The Old Dillon Inn has been closed and vacant since 2007. Silvethorne has recently sent out a request for proposals to redevelop the block that the inn sits on. The western side of the city block leading up to the 4th Street and Blue River Parkway intersection in Silverthorne was covered in mounds of snow on Wednesday morning. Peeking out between the leftover masses of frozen ice is the small handful of businesses that call the area home. The open spaces between the buildings give the block a barren look. While most of the businesses still have open doors welcoming customers, there is one exception. Sitting on the corner, right after 3rd Street, is the boarded up Old Dillon Inn. The building has been vacant for nearly 10 years. Now, the 3.8-acre parcel of land is in for a reboot, after the town of Silverthorne issued a request for proposals on Jan. 13. Officials picked the area as the key component in developing a new town core. “(We’re) really getting that focus on 4th Street, as sort of being that critical link across the community,” said Mark Leidal, the assistant town manager of Silverthorne. Leidal said that back in the ’90s, the town acquired the land across the highway from 3rd up to 6th Street. Even then, Silverthorne staff and councilmembers had started creating the vision for a new downtown area that was more pedestrian-friendly. “It’s sort of the natural extension of (the project) going across the highway,” Leidal said. The town has been working with the two property owners on the block to ensure that “auto-oriented” businesses don’t come into the area. The town manager, Ryan Hyland, said that the meticulous nature of putting this plan together has made the process slow. The town had to work with the owners through rezoning, which took away some of the land-use options. Now he believes the community has finally reached the tipping point. “(People are) seeing where that transformation is really starting to occur, and we’ve been talking about it for many years, but I think we’re finally at the point where it’s happening,” Hyland said. However, planning for a project this big does not happen overnight. Back in March of 2011, the town sent out an initial letter to property owners asking for participants for a focus group. The town partnered with a nonprofit, Downtown Colorado Inc., to create initial designs for what a new downtown area could look like. The graphic depicted a bustling street with large buildings on either side. Juxtaposed next to a photo of the current intersection, the difference is striking. But even with excitement from locals, and support from business owners, the planning process will take time. Proposals are due to the town by 4 p.m. on March 3. From March 20-24 the town will interview selections, picking one proposal by the end of the month. From there, Leidal said that the rest of 2017 will be the planning process for the new crossing. Construction could potentially start as early as 2018. Developers will have to create designs working with some of the features already in place on the block. There is a sewer line that runs directly through the middle of the land. There are also the businesses located there currently, which the town would like to continue working with, in addition to adding at least two restaurants and new tenants. Ken Gansmann, who co-owns The Mint, has expressed to the town that he would like the restaurant to stay on that block. Gansmann also owns a portion of the land in question, and has been working with the town on the project. Gansmann could not be reached for comment. Rob Lyon, the co-owner of the Mountain Lyon Café, said that he thinks redeveloping the downtown area will be good for the town, but has concerns about how construction will impact his business and what the plan will do to parking and traffic on Highway 9. “When it gets busy up here, it gets crazy,” he said. Traffic is a concern for the town as well. Hyland said that they have already started working with the Colorado Department of Transportation, which runs Highway 9. The crosswalk at the 4th Street intersection is one of the first projects with the department, to ensure the safety of pedestrians in the new development. The town has also identified nearly 450 potential spots for on-street parking in the area.